This page describes the Secret object in Kubernetes and its use in Google Kubernetes Engine. Secrets are secure objects which store sensitive data, such as passwords, OAuth tokens, and SSH keys, in your clusters. Storing sensitive data in Secrets is more secure than plaintext ConfigMaps or in Pod specifications. Using Secrets gives you control over how sensitive data is used, and reduces the risk of exposing the data to unauthorized users. You can also encrypt Secrets at the application layer using a key you manage in Cloud KMS. To learn more, see Application-layer Secrets Encryption. generic: Create a Secret from a local file, directory, or literal value. docker-registry: Creates a dockercfg Secret for use with a Docker registry. Used to authenticate against Docker registries. tls: Create a TLS secret from the given public/private key pair. The public/private key pair must exist beforehand. The public key certificate must be .PEM encoded and match the given private key. For most Secrets, you use the generic type. Alternatively, you can also create a Secret by defining a Secret object in a YAML manifest file and deploying the object using kubectl create -f [FILE]. For an example, refer to Distribute Credentials Securely Using Secrets. To create a Secret from one or more files, use --from-file or --from-env-file. The file must be plaintext, but the extension of the file does not matter. When you create the Secret using --from-file, the value of the Secret is the entire contents of the file. If the value of your Secret contains multiple key-value pairs, use --from-env-file instead. The Secret values are base-64 encoded in Kubernetes. Warning: Don't leave plaintext files containing sensitive data on disk. After loading the Secret, remove the plaintext file or move it to secure storage. Running kubectl get secret credentials -o yaml returns the following output. The following example is identical to the previous one, but sets the keys to username and password, rather than using the file names. To load multiple key-value pairs into a single Secret, store the key-value pairs in one or more plaintext files and load them using --from-env-file instead of --from-file. You can load multiple files by specifying the flag multiple times. The same limitations as --from-file apply. The Secret values are base64-encoded in Kubernetes. Non-regular files, such as symlinks, devices, and pipes, are ignored by kubectl. Subdirectories are also ignored; kubectl create secret does not recurse into subdirectories. To create a Secret from literal values, use --from-literal. You specify --from-literal for each key-value pair. The values are automatically base64-encoded. In the preceding output, observe that password and user are base64 encoded. The base64 encoding makes the information digestible by apps and services that can't handle certain characters. The base64 encoding does not provide security. To use a Secret with your workloads, you can specify environment variables that reference the Secret's values, or mount a volume containing the Secret. To learn about using Secrets, refer to Using Secrets. 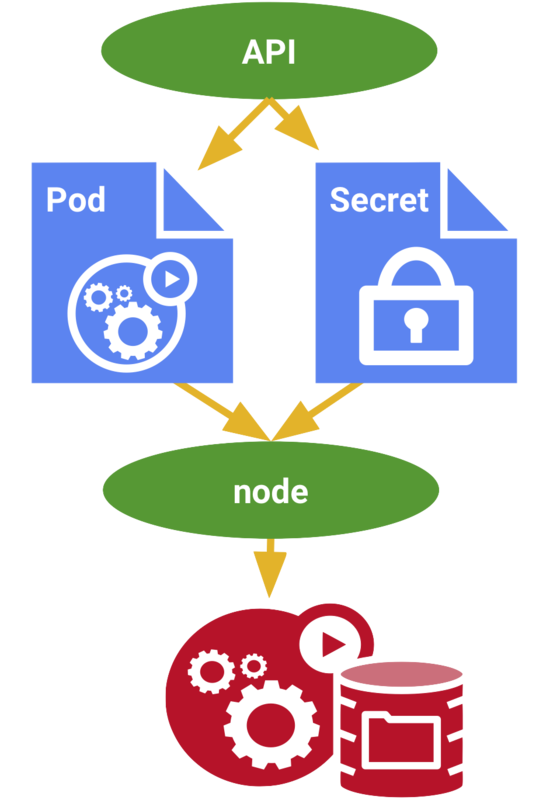 Read more about Secrets in the Kubernetes documentation.